GAHS senior Hunter Copley (10) attempts a shot during the first half of the Blue Angels 51-48 victory over River Valley on Monday night in Centenary, Ohio. RVHS sophomore Hannah Jacks (2) attempts a shot in the second half the Lady Raiders 51-48 setback to Gallia Academy on Monday night in Centenary, Ohio. CENTENARY, Ohio — For now, the bragging rights belong to the Blue Angels. 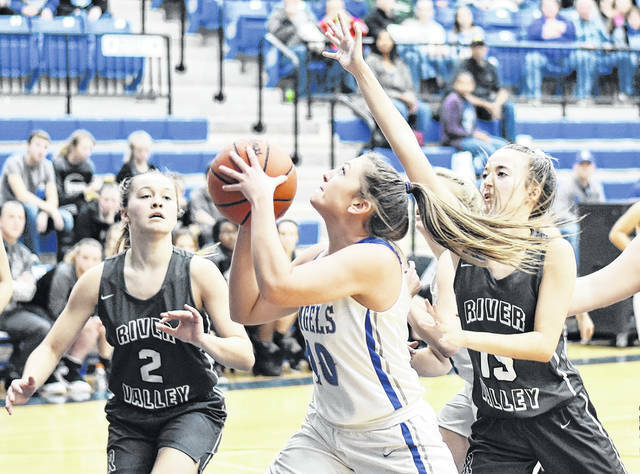 The Gallia Academy girls basketball team trailed visiting River Valley by three points after the first quarter, but the hosts edged out the Lady Raiders 43-37 over the remainder of the contest, as GAHS claimed a 51-48 season-opening victory on Monday in Gallia County. The victory also served as the first win for Gallia Academy first-year head coach Jordan Deel. The Silver and Black (1-1) held the hosts to just one field goal through the opening six minutes of the contest, to build and early 9-4 lead. The Blue Angels (1-0), however, closed the period on a 4-2 scoring run to cut the deficit to 11-8. The second quarter was tightly contested, as GAHS senior Hunter Copley’s three-pointer knotted the contest at 20-20 with 2:02 remaining in the half. From there, the Blue Angels outscored the visitors 4-2 to carry a 24-22 lead into the break. Gallia Academy opened the third quarter with 7-0 scoring run to take a 31-22 advantage with 5:22 remaining in the period. The Lady Rebels, however, ended the quarter with a 10-2 run to cut the deficit to 33-32 entering the finale. Both teams had difficulty from the field early in the fourth quarter, as RVHS grabbed the lead at 36-33, with 6:43 remaining in the finale. Gallia Academy, however, utilized a 15-10 scoring run, capped off by a three-point play by Copley with 34 seconds remaining, to regain the advantage at 48-46. GAHS never again trailed in the contest en route to the three-point, 51-48 victory. For second-year RVHS head coach Stephen Roderick, the setback was something for his team to continue to learn and improve from. Gallia Academy edged past RVHS in total rebounds by a margin of 32-26 in the contest — with 10 of the host’s boards coming in the finale. The Blue Angels finished with 19-of-52 (36.5 percent) shooting performance from the field, including 4-of-8 (50 percent) from three-point range. In contrast, the Lady Raiders shot 16-of-48 (33.3 percent) including 2-of-8 (25 percent) from long distance. From the charity stripe, RVHS was 13-of-21 (61.9 percent), while the hosts were 13-of-26 (50 percent). Alex Barnes led the way for GAHS with 15 points, including a 5-0f-8 performance from the free throw line, while Copley followed with 14 points, including three trifectas. Maddy Petro was next with seven markers, while Brooklyn Hill chipped in six points. Abby Cremeans followed with three points, as Junon Ohmara, Koren Truance and Arianna Jordan each finished with two markers apiece, respectively. The Lady Raiders were led by senior Kelsey Brown with 12 points, a 6-of-8 performance from the charity stripe. Hannah Jacks was next with 10 points, while Lauren Twyman added eight markers, including one trifecta. Beth Gillman finished with five points, including one three-pointer, as Savannah Reese followed with four markers. 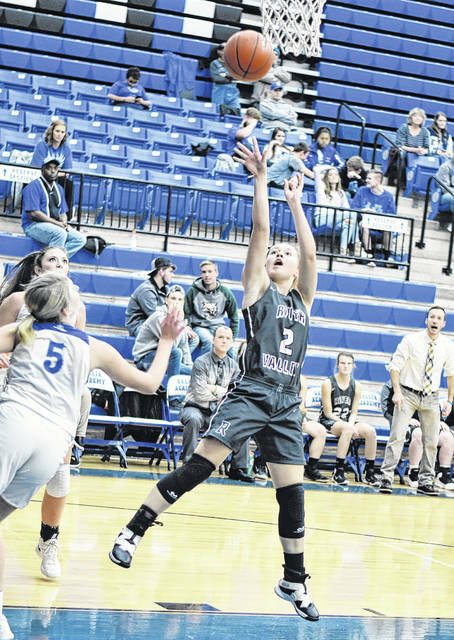 Kaylee Tucker had one trifecta, while Sierra Somerville, Kaylee Gillman and Cierra Roberts rounded out the scoring for RVHS with two points apiece, respectively. The Lady Raiders will look to avenge the setback when the two squads meet on Dec. 17 in Bidwell. Up next for River Valley, a home date with Jackson on Thursday. The Blue Angels also return to the hardwood on Thursday, as they visit Point Pleasant.